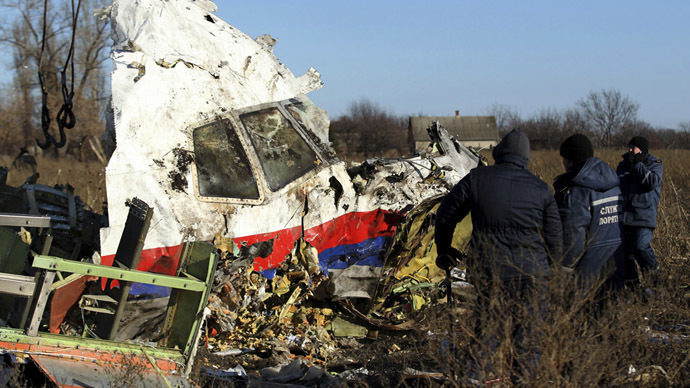 The BUK missile manufacturer has conducted its own probe into the MH17 tragedy. Based on Dutch evidence, its experts believe they have determined the type and trajectory of the missile, which may have led to downing of a Boeing-777 over Ukraine last July. After analyzing the nature of damage dealt to the aircraft, manufacturer Almaz-Antey came to the conclusion it could only have been caused by one of the missiles from BUK’s older line of defense systems, namely the BUK-M1. The missiles in question are widely deployed by a number of post-Soviet states, including Ukraine, but have been replaced by a newer make in Russia. “If a surface-to-air missile system was used [to hit the plane], it could only have been a 9M38M1 missile of the BUK-M1 system,” Almaz-Antey announced on Tuesday. Almaz-Antey’s experts had not “theoretically” excluded the possibility that the Boeing was hit by another type of weapon, such as an air-to-air missile, the manufacturer added, cautioning that final conclusions could only be drawn after all the necessary forensic tests had been conducted by the official investigative commission. “To determine the type of missile that allegedly downed the Boeing-777, the company’s engineers have conducted a thorough analysis of damage to the aircraft skin and basic structure, as well as damaging elements that have been provided by the International Commission as withdrawn from various parts of the aircraft’s structure,” the manufacturer’s statement said. The manufacturer added that among the materials received and examined by their experts were heavy fraction sub munitions, which only the older 9M38M1 missile modification is equipped with. “Production of BUK-M1 missiles was discontinued in 1999, at the same time Russia passed all such missiles that were left to international clients,” the company said, adding that this missile type has not been supplied to the Russian Armed Forces since 1995, and none are currently deployed by Russia’s military. Addressing allegations posted on social media that such BUK missiles have been seen at Victory Day parades in Russia, the manufacturer’s head, Yan Novikov, said that only the newer BUK-M2 systems with 9M317 missiles take part in modern parades, adding that even an untrained eye can tell the two apart. Almaz-Antey has evidence that hundreds of BUK-M1 air defense missile systems and their accompanying missiles were still deployed by the Ukrainian Armed Forces as of 2005, the company’s head engineer, Mikhail Malyshev, told reporters on Tuesday. According to the manufacturer, Kiev had a total of 991 9M38M1 missiles at that time, and information available to Almaz-Antey suggested that they had been maintained by Ukraine’s military. The state of the downed plane’s debris allowed missile specialists to estimate the missile’s position relative to the Boeing at the time of impact. The strike elements moved down the plane’s body, from its nose cone to its tail, Almaz-Antey experts said. The character of the damage and the way the aircraft fell apart made it possible to reconstruct the missile’s launch and determine its trajectory, they added. If the BUK-M1 missile had indeed been used, it could only have been fired from the area around the village of Zaroschenskoe, the manufacturer said. Earlier in April, senior eastern Ukrainian rebel commander Eduard Basurin stated that the Donetsk People’s Republic had got hold of some of the Ukrainian army’s maps, which showed the positions of Kiev’s forces in July 2014, the time of the MH17 tragedy. Zaroschenskoe was then controlled by the Ukrainian Armed Forces, Basurin said. Ukraine’s General Staff has confirmed that Ukrainian Armed Forces possess BUK-M1 missiles, but said that the area the missile was presumably fired from had been controlled by the rebels. The widely-quoted claim is that it was fired from the rebel-controlled town of Snezhnoe (Snizhne), where a mobile missile system was allegedly seen. However, none of Snezhnoe’s 48,000-strong population witnessed the huge rocket trail that BUK-M1 missile should have left behind. 'MH17 most likely hit by 9M38(M1) missile, from the area of Zaroshchenske': BUK missile maker Almaz-Antey analysis at media conference. Reacting to the conclusions of Almaz-Antey’s investigation, Kiev’s military campaign spokesman, Andrey Lysenko, said the exact location the missile was fired from was “unessential” and that the “dozens of kilometers” between the villages of Zaroschenskoe and Snezhnoe could not affect its strike range. “I’m an engineer, I have a habit to use my own knowledge and precise calculations,” Mikhail Malyshevsky, an adviser to the firm’s general director, said, as quoted by TASS. Almaz-Antey’s CEO, Yan Novikov, said in a Tuesday statement that all of the manufacturer’s conclusions were exclusively based on materials provided by the Netherlands, which is leading the MH17 investigation. He stressed that the company’s investigation team had not used any “fake photographs of the crash,” as claimed by some on media. The results of the manufacturer’s analysis were submitted to the international commission investigating the Malaysia Airlines Boeing-777 crash over Ukraine, Novikov said, adding that there has been no reaction so far. The aim of Almaz-Antey’s statements was to prove the manufacturer’s “non-involvement in the MH17 tragedy,” its representatives explained to reporters at a press-conference in Moscow. The BUK missile manufacturer has fallen under EU sanctions, which the firm believes are due to false allegations of “complicity in the tragedy of the MH17 flight shot down over east Ukraine,” CEO Yan Novikov said. Malaysia Airlines Boeing-777, with 298 passengers on board, crashed on July 17, 2014 in the Donetsk region of Ukraine. Flight MH17 was en route from Amsterdam to Kuala Lumpur, and the majority of its victims were Dutch citizens. The Netherlands is leading the investigation into the cause of the tragedy, but no final conclusions have been made public so far.